Save time, reduce stress, and improve patient care by automating your patient form completion process. A time-saving process delivering big-time results. RecordQuest provides the proper staff, experience, and technology for your patients to receive, complete, and pay for required patient forms. Your patients can now receive their completed FMLA, Short-term and Long-term Disability, DMV, and Insurance forms in a fast, accurate way. Need A Custom Patient Form Solution? RecordQuest’s technology advancements and unparalleled customer service allow for facilities to incorporate unique and facility-specific forms within their service model. If you would like to work with us to create a custom form solution for your practice or facility, let us know. Why do so many healthcare facilities rely on RecordQuest? 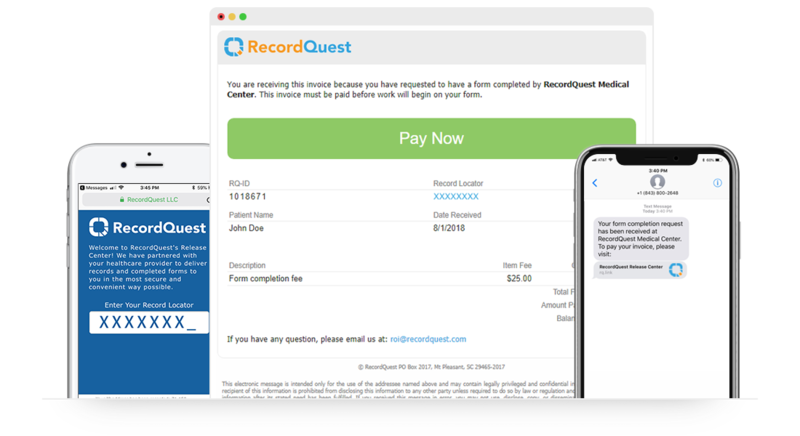 RecordQuest’s ROI and Patient Form Completion services combine superior software and unmatched, diligent compliance standards resulting in a smooth, simplified, and timely process.